The project concerns the renovation of a farm into equipment intended for public sensitization of agriculture in urban areas and more particularly in the Neerpede area, one of the last rural areas in the Brussels Region. 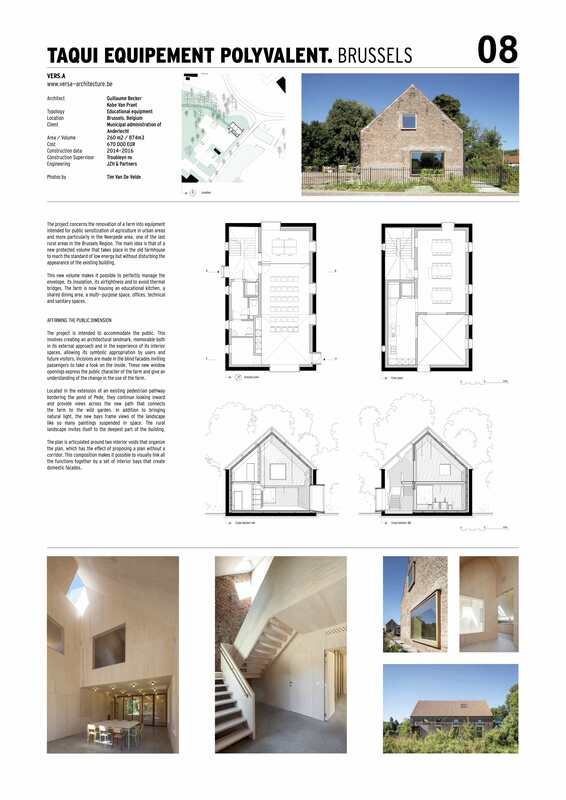 The main idea is that of a new protected volume that takes place in the old farmhouse to reach the standard of low energy but without disturbing the appearance of the existing building. This new volume makes it possible to perfectly manage the envelope, its insulation, its airtightness and to avoid thermal bridges. The farm is now housing an educational kitchen, ashared dining area, a multi-purpose space, of ces, technicaland sanitary spaces. The project is intended to accommodate the public. This involves creating an architectural landmark, memorable both in its external approach and in the experience of its interior spaces, allowing its symbolic appropriation by users and future visitors. Incisions are made in the blind facades inviting passengers to take a look on the inside. These new window openings express the public character of the farm and give an understanding of the change in the use of the farm. Located in the extension of an existing pedestrian pathway bordering the pond of Pede, they continue looking inward and provide views across the new path that connects the farm to the wild garden. In addition to bringing natural light, the new bays frame views of the landscape like so many paintings suspended in space. The rural landscape invites itself to the deepest part of the building. The plan is articulated around two interior voids that organize the plan, which has the effect of proposing a plan without a corridor. This composition makes it possible to visually link all the functions together by a set of interior bays that create domestic facades.